The Audi Q7 e-tron is a diesel plug-in hybrid rather than the more common petrol plug-in hybrid, which aims to offer zero emission local driving and economical long distance driving – so does this concept work? Every plug-in hybrid that you can buy in the UK at the moment has a petrol engine – with the exception of the Volvo V60 D5 Twin Engine. The reason for this is that manufacturers believe they can sell more petrol plug-in hybrids globally than diesel plug-in hybrids – due to existing global market preferences, and because the media is demonising diesel. 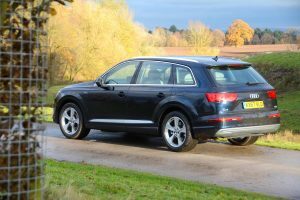 Diesel does have more of an adverse impact on local air quality then petrol, but the idea behind the Audi Q7 e-tron is that you can drive on electric power, with zero tailpipe emissions, in local built up areas, and then have a more efficient diesel engine for longer journeys. So how does this work in practice? The Audi Q7 e-tron has a V6 3.0-litre diesel engine together with a 94kW electric motor powered by a lithium-ion battery. There’s an 8-speed automatic transmission, and quattro four-wheel drive. 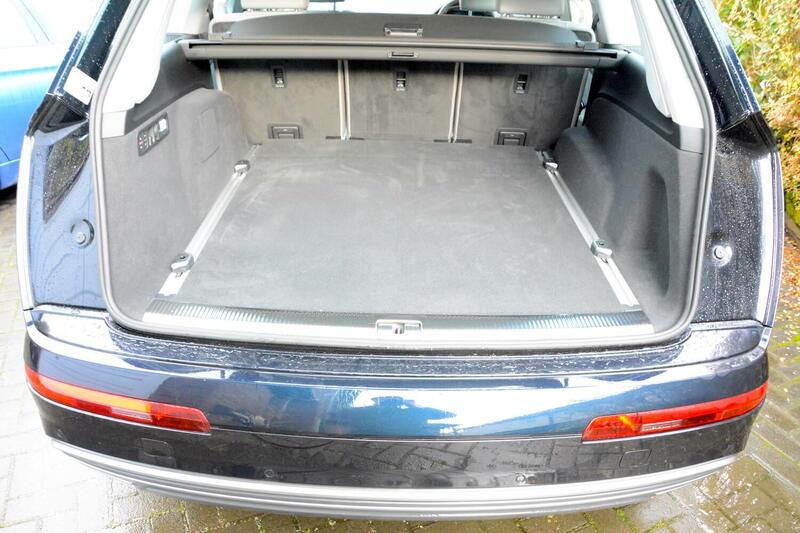 The Audi Q7 e-tron is a large car; this means that there’s lots of space – for five occupants in the case of our hybrid test car, although you can have seven seats in other models – and there’s a huge boot. 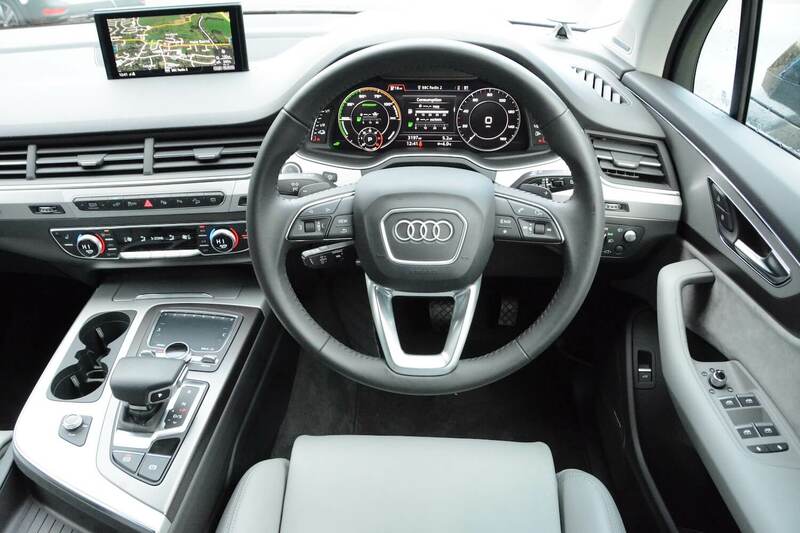 The interior is what we’ve come to expect from Audi – it’s a high quality environment, even if it is a bit busy with lots of information everywhere you look. The Audi Q7 e-tron is a big car, weighing two and a half tonnes. So one of the first things that you notice when you drive it is how well the car combines a comfortable ride with lack of significant body roll for its size. 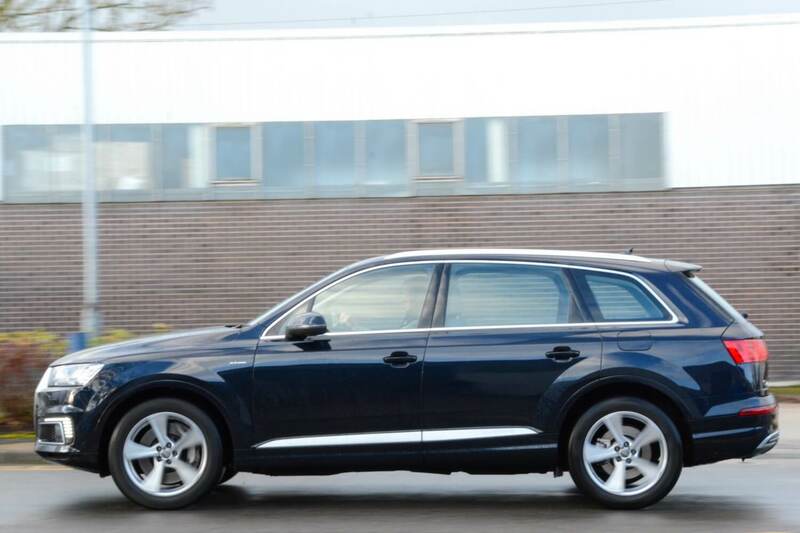 Of course, we’re not saying that the Q7 is agile – no car of this size and weight can be – but the ride/handling balance is impressive. There are a number of drive mode settings to choose from. Firstly, there’s a button that allows you to choose between the powertrain settings of EV, Hybrid or Battery Hold. Then there’s the drive select options of Lift/Off Road, Allroad, Efficiency, Comfort, Auto, Dynamic and Individual. And you can also select D or S for the transmission – as well as change gear manually using the steering-wheel mounted paddles. So there should be an option for everyone in there somewhere. 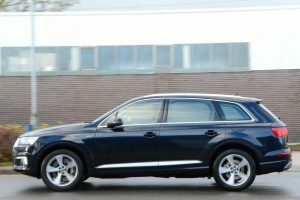 Like most electric cars, the Q7 is excellent to drive when running purely on electric power, as it’s very refined and quiet. 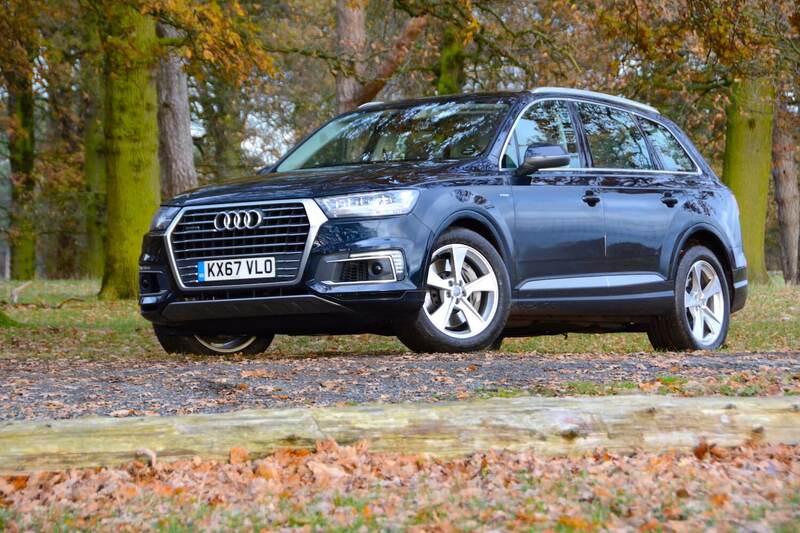 On long motorway journeys using the diesel engine the Q7 is very comfortable and luxurious. On A and B-roads the steering is well weighted and reasonably responsive, although there’s not much feeling. Performance is good for a car of this size and weight (0-62mph takes 6.2 seconds in Hybrid mode, and 6.5 seconds in Electric mode – with a top speed of 83mph in EV mode). Perhaps most significantly, a huge 700n Nm of torque is available. The Q7 e-tron may potentially be seen by some people as ideal for the zero emission school run, but around town, the car feels very big. The Audi Q7 e-tron also has quattro four-wheel drive. This means that it has added security on tarmac roads in poor weather conditions, and it can venture off the tarmac. 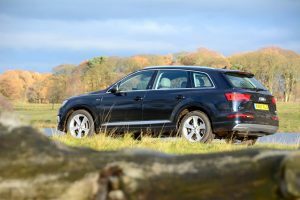 Its off-road performance is helped by the ability to increase its ride height, but ultimately the Q7’s grip in mud or snow will be limited by its road-biased tyres. 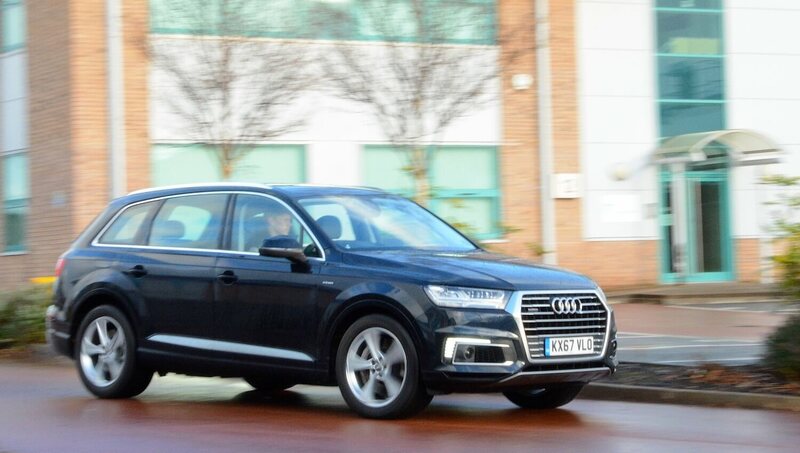 With all the instantly available electric torque, the Q7 should have immediate responses from standstill, but an auto-hold system on the brakes means that they take a moment to release, and sometimes it’s not particularly smooth when this happens. The brakes can also be sharp when being applied. Perhaps our biggest complaint with a car that’s this expensive is that there’s no reversing camera – even though small hatchbacks that cost £15,000 often have such a feature. The official NEDC combined economy figure for the Audi Q7 e-tron is 156.9mpg, equating to 48 g/km CO2 emissions. This is based on the NEDC test, which is being replaced by the new WLTP test, and this is likely to result in much more realistic economy figures for plug-in hybrids in real-world driving. The real-life economy figure completely depends on how many miles you drive on electric power. During a week with the car we covered 457 miles, including a trip from Manchester to Bristol and back, and overall we averaged 42.8mpg. For a large 4×4 that weighs 2.5 tonnes we’d say that this is a good result. If the Q7 had a petrol rather than a diesel engine, we’d estimate that it would have returned around 25-30mpg after such driving. The 167 mile journey to Bristol and back took in the M5 and the M6 – in other words, traffic jams due to people crashing are guaranteed. Being able to drive on pure electric power in stop-start motorway traffic is a great help with the economy. The Q7 averaged 40.8mpg over the 334 mile return trip, and that was with the battery being charged at Manchester and at Bristol. And with three people and luggage on board. The official electric driving range of the Audi Q7 e-tron is 34 miles. We typically had a 25 mile range displayed, but in real life the Q7 managed an average of 19 miles on its battery (in winter temperatures). In stop-start urban driving in EV mode, the battery range goes down quickly – not a surprise for such a big, heavy car. The 156.9 mpg and 48 g/km CO2 emissions figures are based on 19-inch wheels; for 20 or 21-inch wheels, the economy drops to 148.7 mpg, and the emissions increase to 50 g/km CO2. 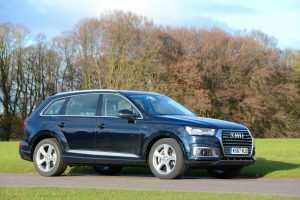 And it also should be noted that a large SUV such as the Audi Q7, which weighs a huge 2520kg and has a drag coefficient of Cd 0.33, is one of the least efficient body styles that you can choose. 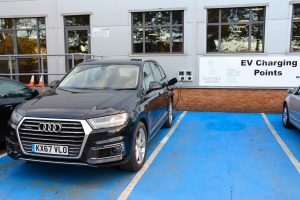 We charged the Q7 on a domestic three-pin plug as well as a 7kW Electric Nation smart charger; using the three-pin plug the car predicted that it would take six and a half hours to charge from empty. Recharging the car at night isn’t made any easier by a lack of a light in the charging socket on the car. 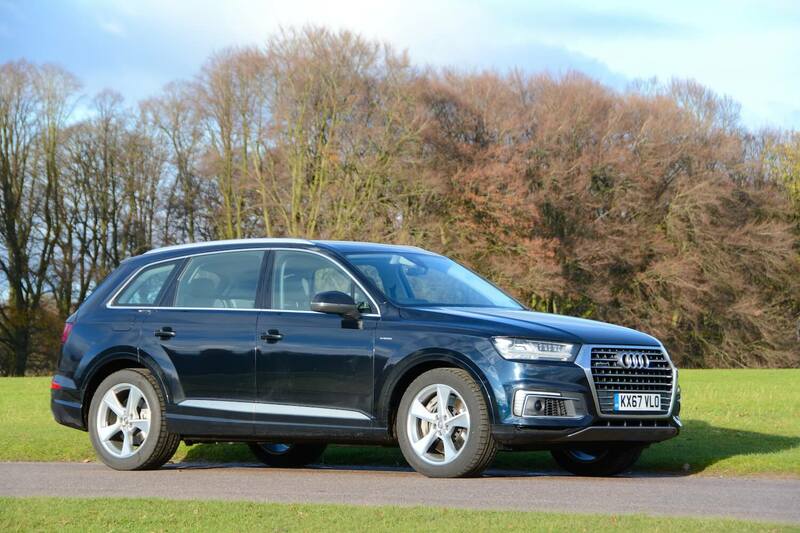 The Audi Q7 e-tron costs £65,815. However, in typical Audi fashion, our test car was fitted with a number of extras, which make for amusing reading, as follows: Front Sport seats with Valcona leather and Rock grey upholstery (£2,850), 20” ‘5-arm aero’ design, partly polished alloy wheels (£1,200), Matrix LED headlights with LED rear lights and dynamic rear indicators (£950), Extended LED Interior Lighting Pack (£280), Tour Pack (£2,800), Technology Pack (£1,695), Trailer Pack (£1,300). However our favourite option was the Bang & Olufsen 3D Advanced Sound System (£6,300). All these items brought the total price of the car to a hefty £84,560. 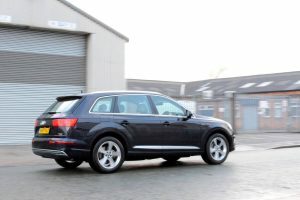 However the good news is that the 12% benefit in kind tax rate of the Audi Q7 e-tron will appeal to company car buyers. The Audi Q7 is available from around £50,000 with a conventional diesel engine. Green Car Guide has been communicating about the impact that diesel emissions have on local air quality for over ten years. However, diesels also offer better economy than petrol engines, along with lower CO2, especially in vehicles such as large SUVs. We’ve tested every plug-in hybrid on sale in the UK, and we can verify first-hand that large petrol plug-in hybrid SUVs are not economical for long distance, real-life driving. Over 457 miles we averaged 42.8mpg in the Audi Q7 e-tron. If it was a petrol plug-in hybrid rather than a diesel plug-in hybrid we imagine that we would have averaged somewhere between 25-30mpg. So a number of factors need to be taken into account when rating the Audi Q7 e-tron, but for drivers who cover up to 20 miles or so locally between charges, and then undertake longer journeys, this car will offer better economy than a petrol plug-in hybrid, and if driven on electric power, it can offer zero tailpipe emissions in built-up areas – so much better than a conventional diesel. 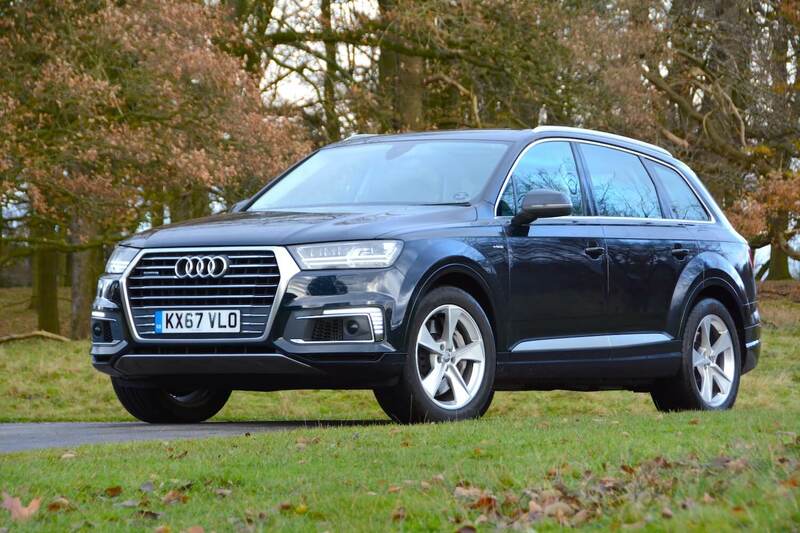 It also has all the refinement that you would expect from an Audi, along with huge amounts of space, the security of quattro all-wheel drive, and sufficient ground clearance to provide reassurance on most off-road tracks. 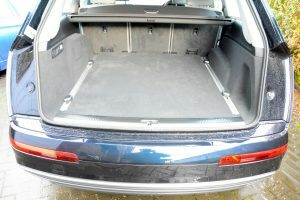 However all the above doesn’t come cheap, at £65,000 for the basic car, or £85,000 with all the options on our test car. But perhaps the big issue is that a large 4×4 that weighs two and a half tonnes is never going to be efficient, and therefore not truly green. 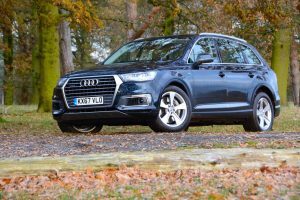 However overall we think it should be recognised that Audi has taken a common sense approach to the powertrain in this car, rather than being forced into a petrol plug-in hybrid approach due to media hype. The Audi Q7 e-tron offers the potential to produce no emissions that have an impact on local air quality, while at the same time combining respectable economy and CO2 figures for longer journeys, so the Q7 e-tron is awarded a Green Car Guide rating of 9 out of 10.